Moorland Walker: Dartmoor: Shillyrock or William Crossings' "Druid's Altar"
Back home, I did a bit of research on the area. The go to source is, predictably, William Crossing's Guide to Dartmoor, and straight away there is a possibility, with the mention of the wonderfully named "Druid's Altar". Crossing only mentions the altar in passing, which leads me to believe he only knew of it, but had not visited, so this has made it difficult to locate. Tim Jenkinson had cited a few possible outcrops in the Blackingstone area, none with certainty, but I was starting to believe this was it. 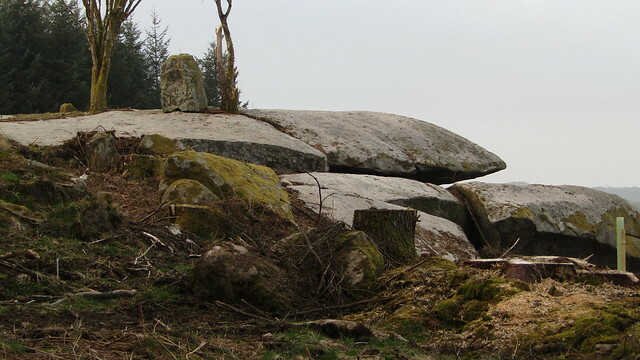 From afar, this outcrop certainly resembled a great slab and it's prominence would naturally add itself to any mythical or magical tales; my first thoughts were of Narnia and Aslan being slain at the stone table by the White Witch. Google Satellite imagery supports it being a huge flat top or "stone table", but evidence of any talking lion being sacrificed is unlikely to be found. Google Satellite view of the "altar"
Later digging, after my visit, revealed the name "Shillyrock" on the 1809 Ordnance Survey map. It seems that subsequent maps chose to name the hamlet to the south-east; Smithacott, which would explain Shillyrock disappearing. The name would likely not have been known to Crossing. Add that the land was turned over to forestry, it was destined to vanish from public consciousness. So, what of my visit? 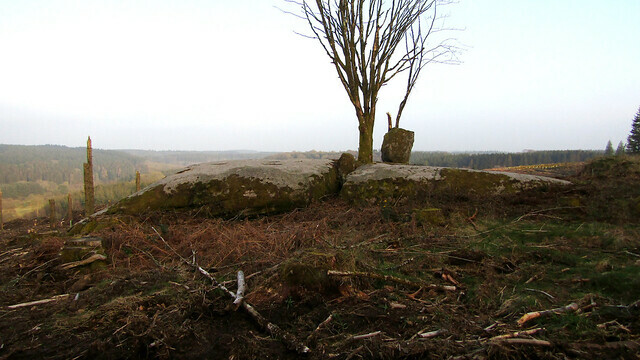 I should point out that this outcrop, to the south-east of Blackingstone Rock (where I parked), lies within a forestry plantation of which public access is probably not permitted. 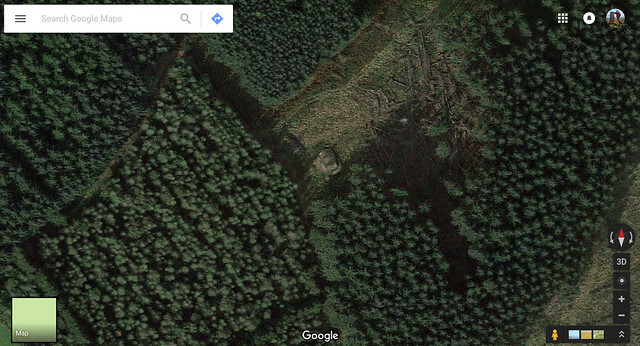 I saw evidence of warnings regarding the logging in operation, but, with decent tracks, little to suggest that, whilst private, this was a complete no-go area. Reaching Shillyrock is fairly straightforward, by track and extremely rewarding to see close up. 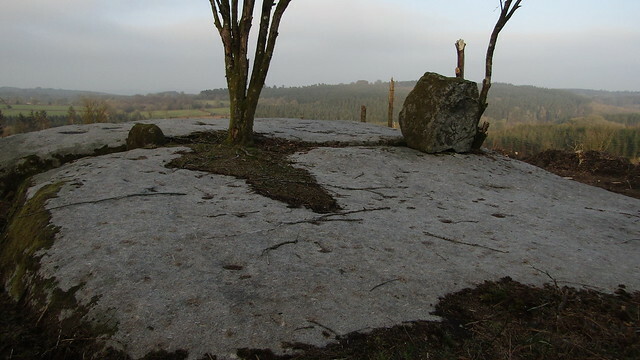 This low white stone granite, at SX 7927 8512, on the south-eastern brow of the hill above Smithacott, is in sharp contrast to its famous neighbour, the huge domed Blackingstone Rock. 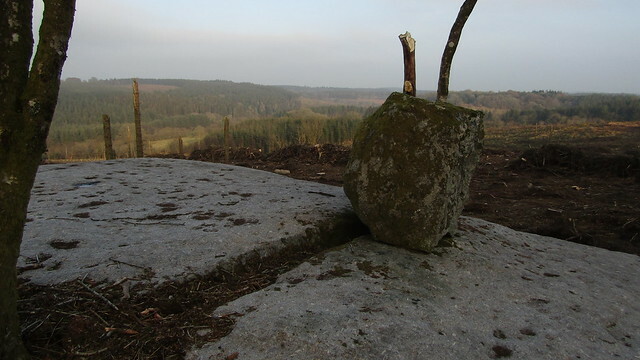 It comprises of a top slab, resting upon a fragmented lower one. The altar is split in two and this neatly lends itself to my Aslan theory. 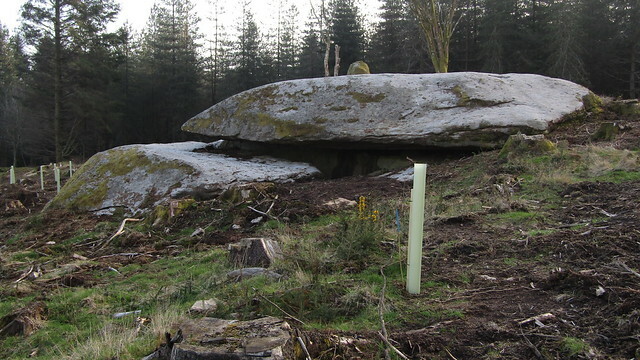 The fissure has a small single rock wedged within, beside two trees (possibly one) that have taken root and will, I'm sure, provide some shade when the leaves appear. 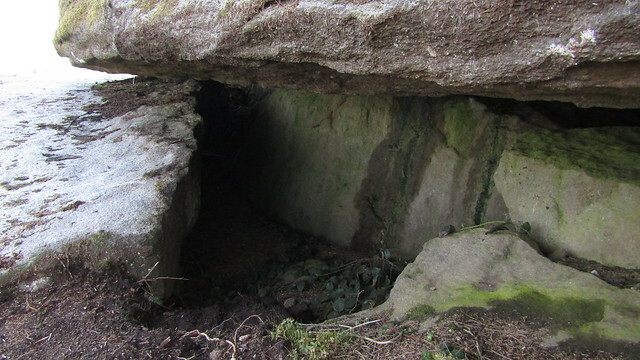 Viewing from the front, the top slab overhangs, creating a tight, damp cave. With the encroaching brambles across its floor this would make a very inhospitable place to shelter. Back to the top, the square(ish) boulder of granite resting atop is a bit of an oddity. Is it placed deliberately, acting as some ancient pulpit, or a result of the immense geological forces that created this terrain, or simply a convenient place for the loggers to dump it in order to continue with their wilful destruction of this landscape? With the sun setting, I returned to the car the way I came. 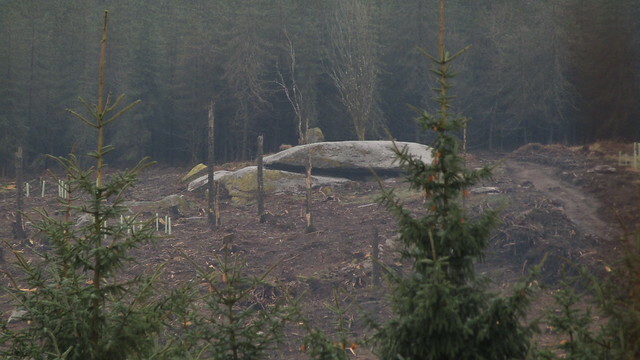 As I passed through the plantation, I wondered what was to become of Shillyrock; would the forestry replant the surrounding hillside and the outcrop be destined to disappear again, in the same way the likes of Lowton Rocks has done in Fernworthy Forest? That would be a great shame, but at least by documenting my visit, it won't be forgotten this time.